I see a lot of concern from mothers who can not afford some of life's basic things, much less luxuries but desperately want to be prepared for a natural birth in a birthing climate that is decidedly not natural friendly. First- this is totally possible. As a teacher, I do think it is great to take a class, but here are some ideas depending on what you can afford. ~Some teachers will let you make payments or will do classes for trade, or even do a shorter, less expensive, intensive class. ~Finding a new or preparing doula- they have to do a number of births to get certified and may charge less for those (or maybe they only charge for gas or childcare.) Here is the website for Dona International, a doula certifying group. ~Just have a friend or family member who has birthed naturally and whom you trust support you in your birth. Part of the help is simple woman to woman knowledge and support and presence. ~For mamas who have a partner deployed in the military, there is a group, Operation Special Delivery, that offers doula support for those mamas. You can find them here. If you want a home birth but have no insurance, you may still be able to find a support person. ~Some midwives do trade or reduced fees for cash payment. ~New midwives (apprentice) often charge less and still work with a experienced midwife. ~Free birth~ Some women feel like this is the best option for them. It does take lots of preparation before hand, knowledge, and faith. Cost is very minimal. 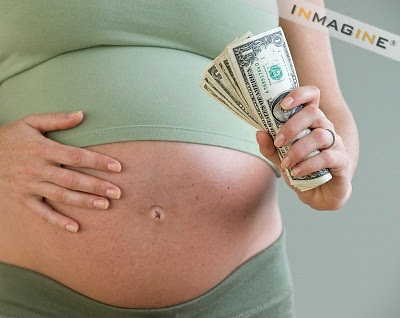 Although I don't think finances alone is a good reason to choose unassisted/freebirth. It is also a big responsibility for the couple. Home birth is not necessary for an un-medicated birth! Going to a hospital by choice or need does not FORCE you to have a bad experience. Here are some tips for making yours go as you would like. ~Be well prepared and knowledgeable. ~Make a birth plan, and then talk to your care provider about it. Then, switch care providers if they are not on board. It is not a magic weapon, but it is a tool that can help you find out where they stand and it can create a dialogue. ~Go to the hospital later rather than sooner (if you feel comfortable with that). And, if you arrive and you are not in hard labor or showing signs of hard labor, don't be afraid to go home and labor where you feel more comfortable. ~Be kind but firm. A hospital can be a foreign and intimidating place. Be strong anyway. I have heard of women birthing beautifully in very anti-natural hospitals. I heard a doula talk about a mom (first time) who had to deliver in a hospital like that. She walked in, late in labor. She wanted to squat her baby out. She got on the edge of the bed and just did it. They told her to lay down. She just said no and squatted her baby out. I am not advocating rudeness or yelling. But don't forget whose birth this is. It is not THEIRS. It is yours. You do not have to be steam rolled by the system. This can be easier said than done, as being in labor it can be hard to advocate for yourself. That is where an educated partner and a doula can really come in handy so that you are not afraid and alone. In some states birth centers exist and can be covered by insurance or medicaid while home birth is not. A birth center can be a great option for somebody who wants an out of hospital birth but can not afford to pay a few thousand dollars cash for a home birth. You can find lists of birth centers here. A natural birth is perfectly possible in any number of settings no matter your financial situation. You made such a great point! This is my first pregnancy and natural birth has always been so important to me. I had dreams of delivering at home but we just couldn't afford it. As it turns out our insurance covers a CNM, hospital and birthing center births. Most insurances will at least cover the CNM which can make a huge difference in your experience. The best thing you can do is ask as many questions as you can to see what resources are available. Thanks for the comments! Since I have birthed at a hospital and a birth center for various reasons, including financial, I do really feel that sometimes there is no way to fit it in the budget. Also- some women just simply don't feel comfortable with it but still really want a natural birth. I didn't mean to downplay doulas. I think they are great for some women, but they are not for everybody. Some people want as few people there as possible at their birth. I probably showed my bias as a teacher too- the vast majority of my students birth in hospitals without a doula. I encourage everybody in my classes though to really consider doula care. This is 100% not true and in fact, most doula trainers and mentors encourage new doulas to charge *something. * Also, remember that not every doula who trains with DONA will choose to certify with them. To reiterate, DONA does not require that a doula in training offer her services for free, nor does she have to offer a certain number for free. If a doula chooses to certify (she doesn't have to) she needs to do 3 births (there are criteria for counting those births toward cert). I understand what you're saying--but your comment implied that some institution had decided that "doulas have do do free births" or something to that effect. If a doula decides on her own that's the path she wants to take, that is of course fine, but the free birth rule is not mandated. In our city no one that I know of is working for free, new or not. I wasn't offended...I just don't want parents getting the wrong idea and assuming that they can get a doula for free. You and your blog is a tremendous resource for people, mothers in particular. Keep up the great work and the great flow of information. Thanks so much for what you do. We were very low on funds during my first pregnancy. I found so many great natural birth books at the local library and community college library. I read them all for free :-) Between the books and internet groups I got my own free childbirth class. The hospitals in my town are both very medical and I didn't feel like fighting them so I stayed home and had an unassisted homebirth, almost free, other than minimal supplies. A great natural birth is totally possible on a low budget, the woman just has to be self-motivated.